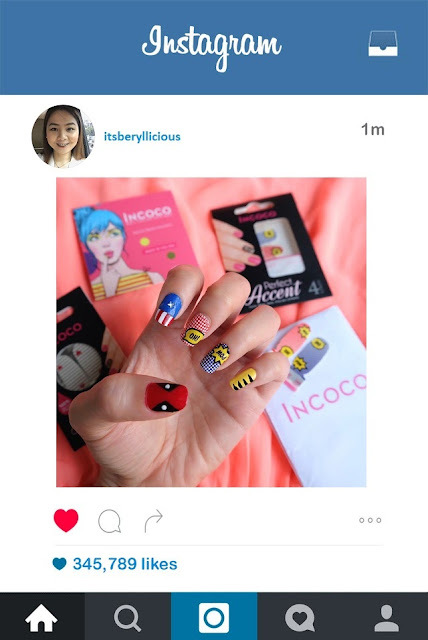 Incoco Nail Polish Applique is your next generation nail polish that promises to give you that perfect "manicure in minutes" every single time. For women who are always on the go, visiting the nail salon could be a considered a luxury of time. Aside from having to book appointments at your nearby salon especially during peak hours, it could also be costly and very time-consuming. I for instance, prefer to do my own nails at home. Working on an 8-hour office schedule, I'm lucky if I'd be able to hit the nail salon after work without being rejected because they are already fully booked for the night. Another reason why I opt to do my own nails is because I love creating and experimenting on nail art designs depending on my mood. As much I want to do more designs and change my nail art often, doing so takes a lot of my time at home. Good thing I discovered this revolutionary nail product during the recent E!Bloggers Ball. 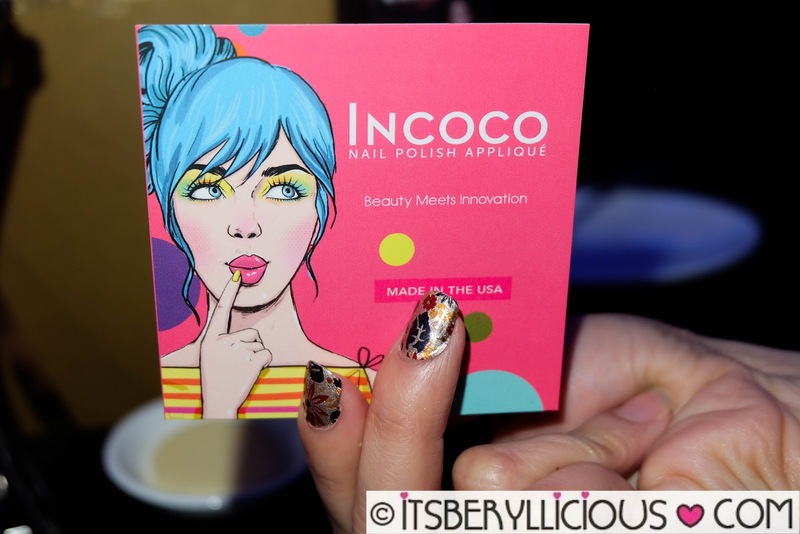 I was able drop by the Incoco booth and tried the Incoco Perfect Accent Collection. My nails underwent a complete transformation from simple to fashionable, in just minutes! 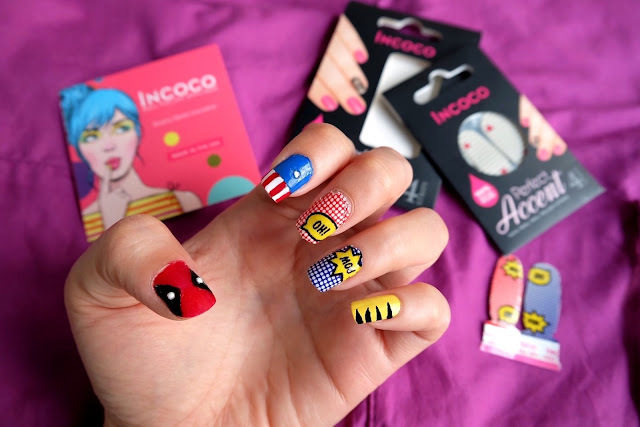 Incoco Nail Polish is not your average nail art sticker. It is 100% real nail polish as compared to other nail art stickers made out of plastic vinyl. Since it is made in USA, you are guaranteed of its quality and ingredients. Each strip is made of multiple coats of high-quality liquid nail polish in a dry-strip form. It is a 3-in-1 nail polish with base coat, color coat, and top coat, compressed in one thin layer for that salon-like quality nail polish. 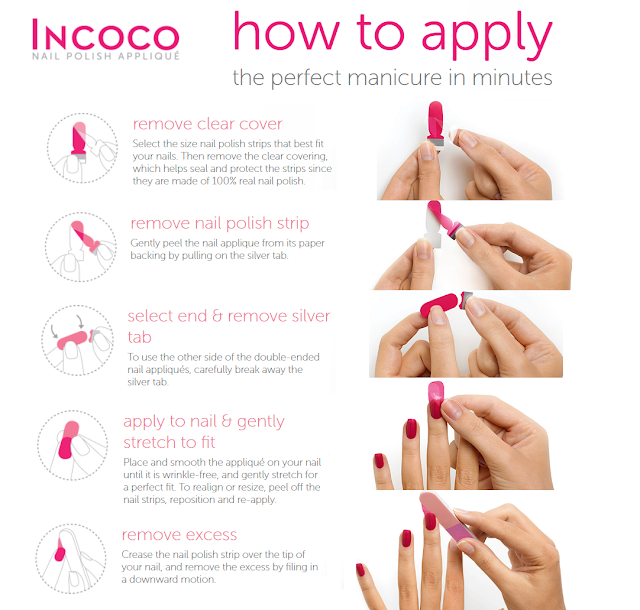 Application of Incoco nail polish strip is fast and easy! It can be stretched to a perfect fit, while the excess can easily be trimmed or filed. Goodbye smudges, streaks, lumps, and long drying time of regular nail polishes. Since someone else applied the Incoco nail accents on my nails during the E!Bloggers Ball, I thought I needed to test it out for myself. Fortunately, Incoco provided all attendees with some samples of Incoco Perfect Accents collection to take home. Now, time to put these nail polish accents to the test. Incoco Perfect Accent includes four nail polish strips that instantly add a pop of color and design to your existing regular nail polish. Since I was in the mood for some superhero/comic-inspired nail art, I chose the Punch Line Nail Accent design with dots and word bubbles. I applied the strips on my middle and ring fingers, and finished the remaining nails with a marvel-themed nail art design. True enough, I was able to pull off this look in less than the average time I spent in creating my nail art designs before. More than the amount of time I saved, what I am truly thankful for is how I've easily done my nails on the right hand like a pro. Well, I still had minor struggles doing 3 nails on my right hand, but at least I managed to finish 2 nails in minutes without the mess and smudges. Plus, did I mention that you can reposition the strips during application, so first-timers should not worry about making mistakes. Alas, my comic-inspired nails are done and insta-ready! What do you think? I've had my nail polish for more than 2 weeks and believe me, the Incoco nail accents were still in perfect condition- no chips, no cracks, no peel offs. Ironically, removing them was a breeze. It cleans off easily with nail polish remover. Incoco Nail Color and Nail Art Designs are available at P395/set and P495/set respectively, while Incoco Perfect Accent is priced at P195/set.